Sutherland Shire, Cronulla, Burraneer Bay, Port Hacking, Dolans Bay, Caringbah, Yowie Bay, Gymea Bay, Grays Point, Illawong, Lugarno, Alfords Point, Menai, Sylvania Waters, Taren Point, Oyster Bay, Kogarah Bay, Como, Bonnet Bay, Kangaroo Point, Oatley, San Souci, Kyle Bay, St George Shire. 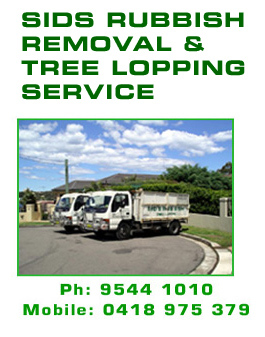 For over 15 years Sid’s Rubbish Removal & Tree Lopping / Removal has been serving the Sutherland and St George Shire. Equipped with the latest rubbish removal and tree removal plant and equipment Sid’s are also well known for servicing waterfront properties with their custom made barge. For an obligation FREE QUOTE call (02)-9544-1010 and remember WE ALWAYS TIDY UP AFTER OURSELVES.